The excitement was in the air, and just looking around you can notice an obvious difference in the audience of the premiere night – most of the people know each other, greeting, chatting and looking for the rooms where their designated reception is held. The main sponsor of BSO, The Linde Group, gathers their crowd at the 1st Rang ballroom. Nice gowns, tuxedos, BR Klassik live transmission aired from the 1st Rang lobby with interviews of director and contributors. 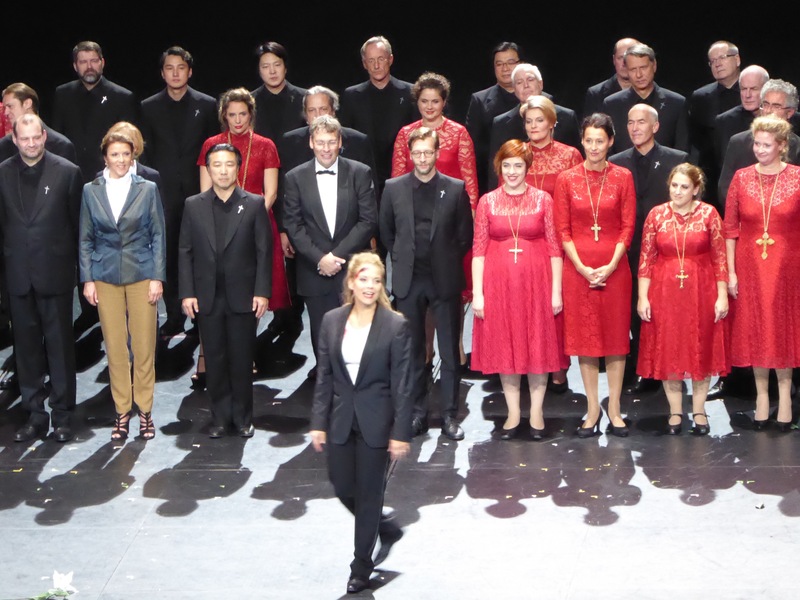 To raise the bar even higher Elīna Garanča, Mariusz Kwiecień, Mathew Polenzani and Mika Kares – the all-star cast is assembled for the season premiere of “La Favorite” at the Bayerische Staatsoper. The excitement and expectations in abundance! 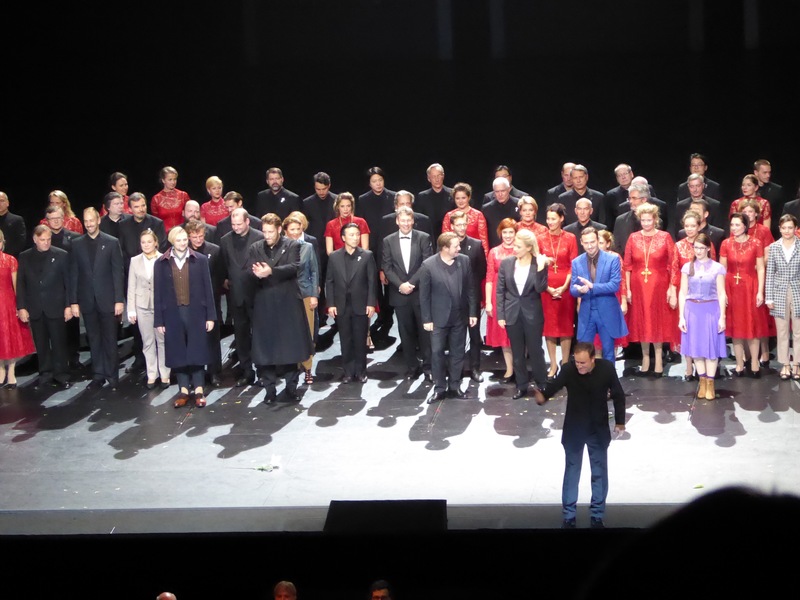 I was very curious how the opera I have heard twice in a concert version with Elīna Garanča – first in Salzburg 2 years ago, then in Deutsche Oper in Berlin a year ago – would be staged at BSO. No doubts, I expected modern interpretation of the story, meanwhile still longing more of a period drama to be staged accordingly. The staging was a bit confusing mostly due to noise and disruption of the musical line either by moving or rattling panels or throwing around chairs as main decorative and staging element of the performance. The chairs as a concept of your place defined in this world and what do you do to safeguard yours or to conquer a free one was well positioned but not developed to the required conclusion. Some interesting ideas related to the panels and moving sculptures, including Christ on the crucifix, were well meant but inconsistent and did not provide an opportunity to reflect for respective conclusions since next move was coming with a new message. 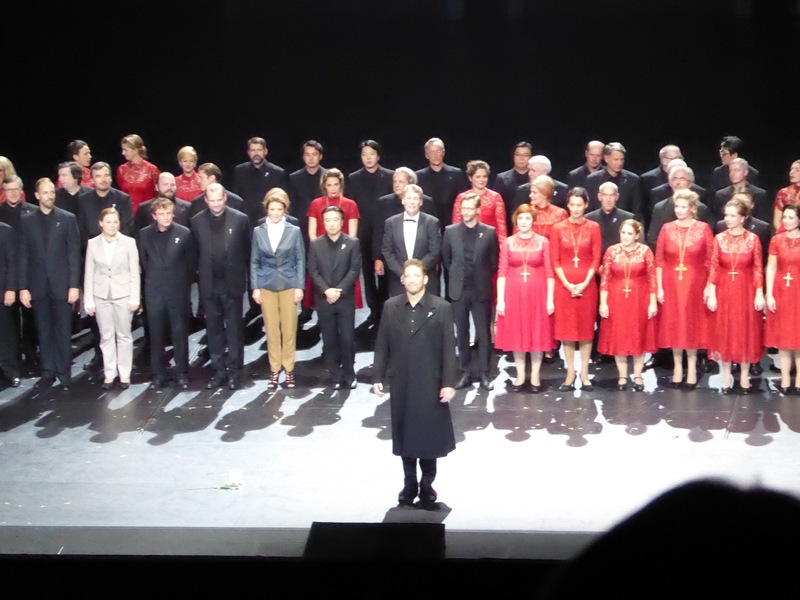 The costumes were designed to complement the staging and story telling of power and dependency, the obvious hint of bright red coat worn by Leonor, very bright colorful suit of Alphonse, as in contrast grey and black outfits of people representing faith – and unexplainable red dresses worn by chorus at the Act 3 wedding scene where the bride was dressed in all black – missing some hint from transformation of color coding here or this might be another unfinished message from directorial side. The production in overall fits well to most of the recent new productions seen in BSO, also consistently kept in aesthetics of dark grey or black palette. The biggest surprise of the night was impeccable, vocally outstanding performance by Matthew Polenzani as Fernand. Polenzani rewrote libretto for me, creating another reading where Fernand is unquestionably the main protagonist. In this interpretation, where the focus is on the destiny of young man, sidetracked by romantic affair and discovering passion infused by love, Leonor is just a vehicle towards his challenges and subsequent fate, she is accidental pawn for the costly decision on which side Fernand prefers to stay – either dedicated to faith or to love. 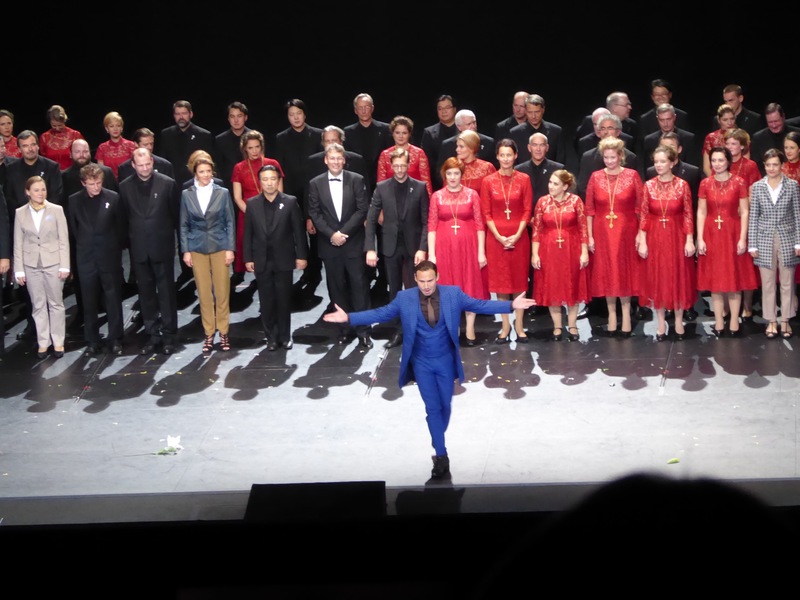 Polenzani delivered passionate, emotionally charged and brilliantly sung character – his tenor was bright and silvery, with clear ringing at the top and finesse in pianissimo. Compared to other roles I have seen him either in live performance or transmissions, this one fits his vocal and dramatic talent the most – experience worth to relive again in live transmission on November 6th at staatsoper.tv! Elīna Garanča as nominal protagonist of the opera carried out her role driving the whole ensemble and keeping the storyline together. The libretto does not clearly state how Léonor has taken the place of king’s favorite. The production lets us make up the missing part of story ourselves – she is behaving mostly unwelcoming to Alphonse attempts for physical contact, while at the same time succumbs and let us read that she is king’s property. The portrayal of the character mostly lies in Garanča’s vocal mastery, her line of legato is freely flowing, the lower register is smoky and plush, while the top register has gleaming brightness and admirable agility. Her “O mon Fernand” was sung with such intensity that audience forgot to breathe, and one overenthusiastic spectator even burst into premature ovation in the midst of the aria. Belonging to the same nationality – Latvian, I do understand the way how Elīna views her character, and certain resignation and introversion embedded which might be misread as a lack of temperament and passion. On the contrary, Léonor’s passion is burning deep inside and is not on the surface for others to see, thus the portrayal becomes whole and complete if you can feel that pain and burning passion inside – projected through voice by Elīna Garanča. Superbly sung, nuanced creation of the character of the main protagonist and her relationship with both contenders – charming, dominating and a bit childish Alphonse, and decisive, passionate and proud Fernand. The charming king Alphonse was brought to life by one of the best acting baritones for this repertoire Mariusz Kwiecień, who demonstrated his outstanding dramatic talent in the intermezzo where instead of a ballet, Alphonse and Léonor were watching movie and Kwiecień was doing fantastic acting performance, it even seemed that I am together with them on the stage watching the same movie – overflowing emotion and engagement of the audience. Great directorial success using the gift of superb singing actor! His voice has matured, adding to the vocal palette more colours of depth while still maintaining same agility for the top register. Thus masterful portrayal of a multifaceted king is delivered with ease and attention to detail using fluent combination of vocal and dramatic means. Another great contributor to the overall performance was impressive bass Mika Kares in the role of the Balthazar. He possesses the vocal instrument of admirable timbre, large, easy flowing and well projected throughout the audience. I had a privilege to hear his performance first time just last summer in Bregenz both in Hamlet as the substitute for an indisposed colleague, and next night as Timur in Turandot and was much impressed. He performed even above my high expectations and I will certainly seek further opportunities to hear him more in the future. 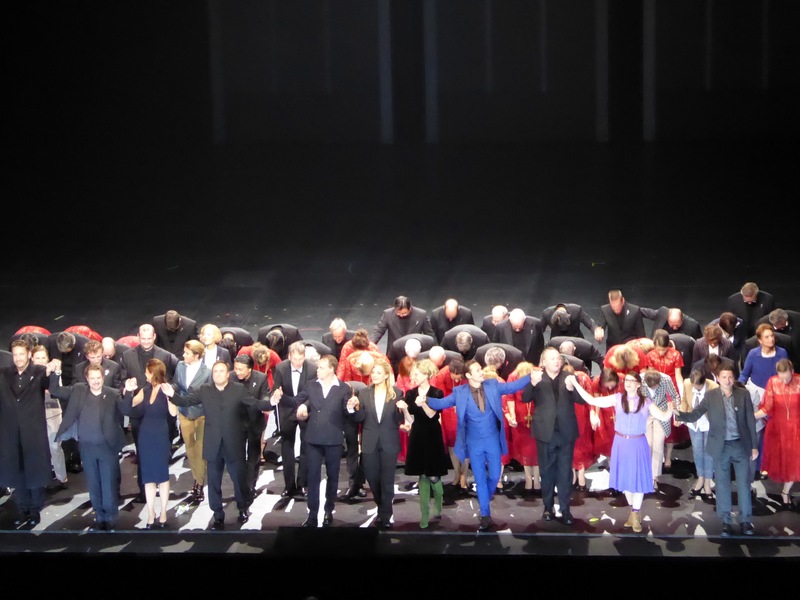 Ines by Elsa Benoit was well sung, but somehow her character lacked more attention from director since both her actions and costumes made her almost invisible in the ensemble. Her soprano is bright with a clear ringing top register and ability to deliver nice embellishments. Chorus left an impression of insufficient rehearsal time since there were several glitches between stage and the pit especially on change of tempi. The director attempted to depict the opinionated crowd which aggressively moves into proposed direction as directed by the power of authority, thus making them part of the staging concept, and that does not work always well, as seems some better coordination could help. This might be an impression of the prima, since first performance always has some imperfections that work out in subsequent shows. The conductor Karl Mark Chichon read the score with agility and finesse, with high attention supporting singers and never riding orchestra over voices. As he is known for his meticulous and focused approach to achieve the best from the orchestra, it was well heard especially in well-balanced sound among various orchestral groups, not letting either drums or brass to overtake the ensemble. There was a surprise to discover that organ is part of the live orchestra, as Chichon gave unmissable cue while conducting, but the instrument was not visible anywhere. Until now I have thought that organ is run recorded rather than live, as have heard it used in several operas in the house. Should pay more attention to the details going forward! 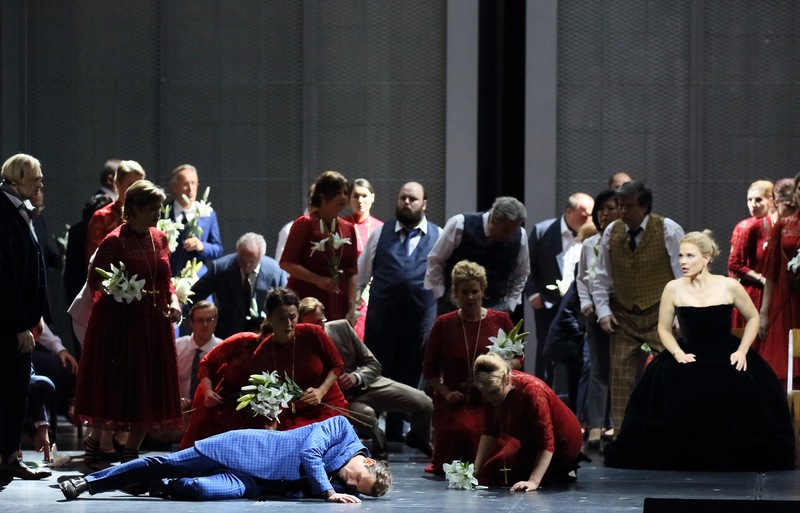 The autumn operabliss weekend in Munich – by taking a second look at “La Juive” and attending highly sought after the premiere of the season “La Favorite” has brought a lot of enjoyment and satisfaction. Looking forward to next trips to Munich, the favourite house – depending on box office favours extended to my advance requests.